All Hue configuration properties are stored in hue.ini but only a subset are exposed in Cloudera Manager. Properties that are not exposed (such as the Authentication Backend for SAML) can be configured in Cloudera Manager with "safety-valves." Important: Do not edit the .ini files at the command line because they are stored in dynamic directories named by process ID and populated from the Cloudera Manager database. Tip: The process directory for any given role is mirrored in Cloudera Manager. Go to Hue > Instances, select a role such as Hue Server, and then click the Processes tab. 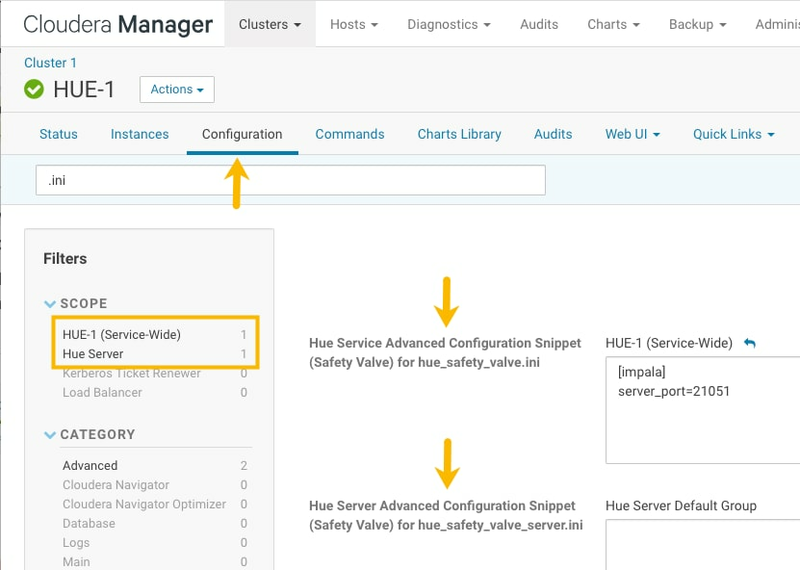 In Cloudera Manager, all Hue properties and safety-valves can be found on the tab, Hue > Configuration. The field for hue_safety_valve.ini is service-wide and affects all Hue roles listed on the Instances tab. The field for hue_safety_valve_server.ini only affects Hue Server role instances. Environment safety-valves let you configure environment variables across the service or for specific role instances. These safety-valves lack headers. 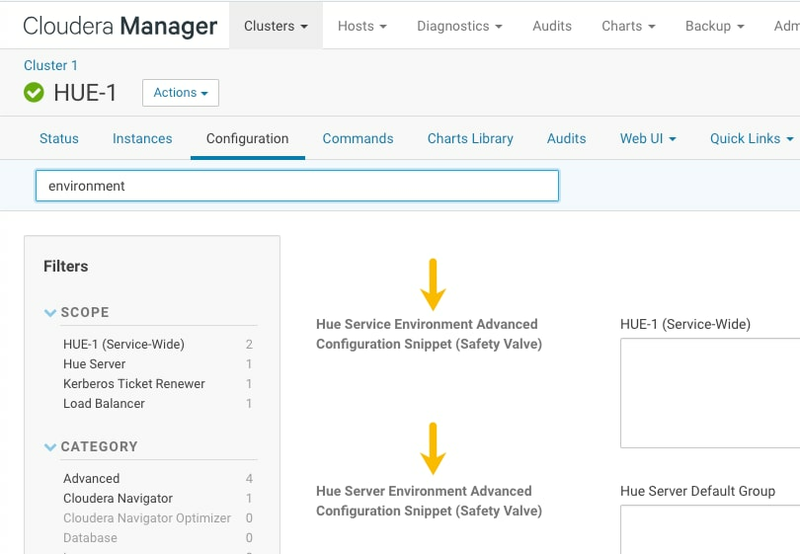 This section explains the logs generated by Cloudera Manager about each Hue role instance and those generated by the Hue service itself. Cloudera Manager logs the starting and stopping of each supervised Hue process in standard stream logs (stdout.log, stderr.log). Configuration errors are written here because they prevent Hue servers and load balancers from starting properly. The supervisor is a watchdog process and supervisor.conf manages all Hue processes; its only purpose is to spawn and monitor other processes. A standard Hue installation starts and monitors the runcpserver process, which provides the core web functionality for Hue. Note: To see active supervisor processes, run: ps -f -u hue. For each Hue role, Cloudera Manager looks to the appropriate supervisor.conf for instructions on how to start the server. Note: Currently, maxbytes=10MB, is hard-coded and cannot be changed for stdout or stderr. If you installed other applications into your Hue instance, you may see other daemons running under the supervisor as well. Supervisor automatically restarts these processes if they fail for any reason. If they fail repeatedly in a short period of time, the supervisor itself shuts down. Once the Hue service is up and running, Hue generates logs in /var/log/hue using log4j. Load balancer logs are in /var/run/httpd. DEBUG is available for the Hue Django logs in /var/log/hue. By default, the Hue service writes INFO level messages and keeps a small buffer of log messages at all levels in memory. Cloudera Manager: Go to Hue > Configuration, check Enable Django Debug Mode, and Save Changes > Restart. Hue Web UI: Go to the Home page, select Server Logs, and check Force Debug Level. Debug is enabled on-the-fly. This section is a cheat sheet for navigating a managed deployment of Hue. HUE_HOME is a reference to the location of your Hue installation. You can Run Hue Shell Commands from this location.